Rated 1 out of 5 by Frank from looks nice but juke Generator had 34 hrs and quit working. Took apart and found hole blown in rotor winding. Wound with aluminum wire. Generac would not replace. Was not over worked, Stator was in perfect shape. Rated 5 out of 5 by deputydave from Great Generator! AAAAA+++++ This is by far the best Generator I have ever owned and operated and I have owned a total of 8 different ones. It powered my home during a recent black out effortlessly for days. It sips fuel and tell you how long it will run, etc. Always a very quick starter and is instantly ready to provide the necessary power. I would buy another one without and hesitation due it's quiet, efficent operation. Rated 5 out of 5 by John64 from Excellent features Bought to supply power to whole house. It exceeded our expectations by running everything without any problems. Run time meter, idle switch, electric start all provided a very satisfying experience during a major storm with an extended power outage. Rated 4 out of 5 by Hud from very reliable Have enjoyed this product immensely, the only issues Ive had are with the battery. Wont keep a charge, so I start it manually. Rated 5 out of 5 by Mercman from Good generator Not much time on it yet. Under half hour. So far seems to have plenty of power to do what i need. Power dont go out too much but gonna buy a transfer pannel for the house so i can power it when needed as my main purpose is for the sump pump. Rated 5 out of 5 by Joe from Great Generator Bought the 7500e generator and I'm very pleased with it.. It's big enough to run my house with it.. 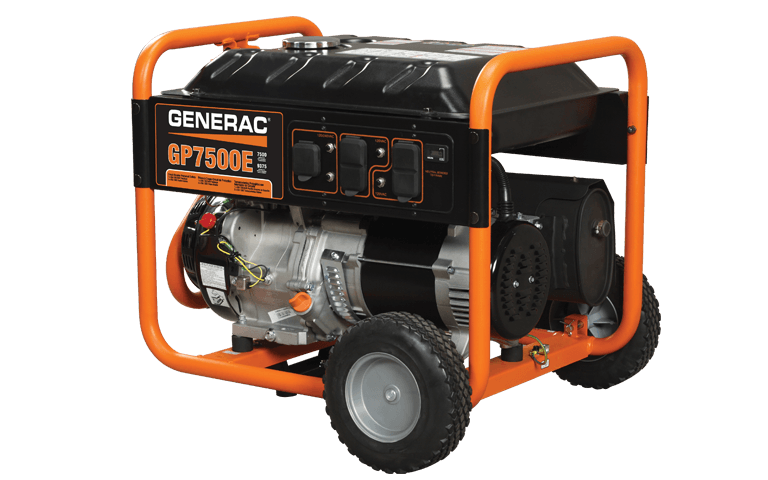 Rated 5 out of 5 by ReggieA from Great buy With all of the weather associated power outages occurring these past years, I decided it was time to purchase a portable generator as a back-up . After looking at what was available, I chose the Generac because of its reputation as a reliable machine and at a price I could afford. Love my purchase and I'm not having any worries about its capabilities and performance. I'm now in ready-mode !! / Bonne achat pour me sécurisé en cas de panne d'électricité !! GP7500E is rated 4.8 out of 5 by 438.